Want to donate right now? Go directly to the Donate Page. 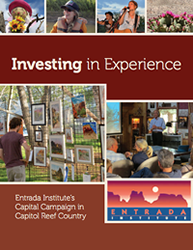 As you know, the Entrada Institute is a vital contributor to the culture and community of Wayne County, and the surrounding area of Capitol Reef. Through music festivals, promoting artists, authors and research scientists, as well as a commitment to the educational enrichment of local youth and residents, the Entrada Institute celebrates the past, present and future of life on the Colorado Plateau. Explore some of the many ways that you can contribute to the future of this exciting organization. The Entrada Institute needs your help with an expansion project. To learn more, go to the Capital Campaign page. In October of each year, the Entrada Institute holds a friendrasier in support of current programs and future projects. To learn more, go to the Friendraiser page. We understand that the convenience of online shopping can’t be beat, particularly when there are so few retail outlets within close proximity. But now Amazon.com offers you the opportunity to help support Entrada’s arts, humanities, cultural, and scientific programs while shopping. To participate, go to https://smile.amazon.com/ch/87-0514231. The Sparking Humanities Program focuses on programs related to the humanities. This multi-year project requires matching funds. We need to raise $25,000 in 2017 and $25,000 in 2018 to receive the $50,000 grant from the National Endowment for the Humanities. To learn more and donate, go to Sparking Humanities Grant. It’s hard to believe that the Entrada Institute has been providing opportunities for artists, humanities scholars, writers, scientists, and performers from Utah and the surrounding region to develop and share their work for more than TWENTY YEARS. During those years, we have provided hundreds of events for thousands of you who love the Colorado Plateau, especially the Cockscomb country around Torrey, Utah. During the next twenty years we will see new demands on the West as populations shift, livelihoods readjust, and the climate continues to change. With your help, Entrada will influence that future by providing interpretive programming, discussion forums, youth education opportunities, and development prospects for thinkers and creative types of all stripes. 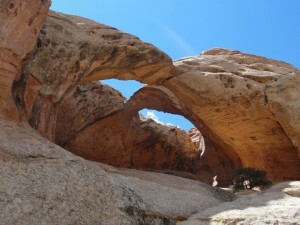 The board of directors invites you to help sustain the vitality of the Colorado Plateau and share the splendor of the Capitol Reef area by contributing to the Entrada Institute. It takes about $30,000 for Entrada to provide its three main programs: Saturday Sunset Series, Artist-in-Residence, and Wayne County High School Scholarships. Our Saturday Series of readings, concerts, slideshows, lectures, and other events enrich the cultural life of Wayne County while providing artists, humanities scholars and earth scientists to share their new and existing works. In these uncertain economic times, many non-profit organizations are struggling to stay afloat. Others have shuttered their doors or significantly cut back staff and programming. Entrada is a very lean organization, run by a working board. Please help us by contributing. Please send your donation to the address (below) or by using PayPal button (below) to help ensure a strong season. Thank you for considering this invitation of support. 87-0514231, and your contribution is tax deductible to the full extent allowable by law.